When considering a horse, don't make the mistake of buying a young one unless you are an experienced trainer or plan to make use of one. A horse over 5 years old is probably manageable and will forgive your mistakes, showing you the right way to do things. An experienced horse person can help you evaluate a horse's conformation - how the horse is "put together". If you intend to compete, you'll want conformation that lends itself to the kinds of competition that you have planned. A horse with conformation problems is not necesssarily a bad horse, but you may find its abilities limited. Determine your purpose before you start looking. Do you want a horse suitable for trail riding or showing, or both? Are you capable of starting a young animal, or do you need an older animal established in its gait? Will you want to raise foals later or is a gelding better suited for your purposes? If a gaited horse, make sure of the gait. Whatever use you have in mind for your horse, remember to look for the chief distinguishing characteristics of the breed. How well the gaits are performed often depends on the horse's age and training. Are you buying potential or proven ability? Many buyers who are looking for a potential show contender will purchase their horse as a two year old. 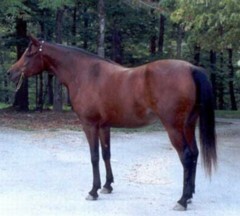 Top two year olds frequently demand top dollar even though they are unproven in the show arena. There are advantages to buying an aged horse. By five years, a horse will have reached maturity in terms of temperament, gait, and size. It may have proven its worth in one or more areas of expertise such as pleasure riding, field trials, versatility events, ranch work, or in the show arena. As with any purchase, if you are unfamiliar with the product, you should know the seller. And, if you don't know the breed or the seller, you would be wise to seek the assistance of a knowledgeable professional to help you evaluate the horse and its sale price as they relate to your intended usage. Many buyers consider a pre-purchase exam by an equine veterinarian to be well worth the cost. Overall soundness is important and, if you will be using your horse to produce foals, suitability for breeding should also be evaluated. Familiarize yourself with the breed's registry rules and regulations. Make sure the last recorded owner on the horse's registration certificate matches the seller on the transfer form. Read the next horse riding tips article on Pleasure Riding.